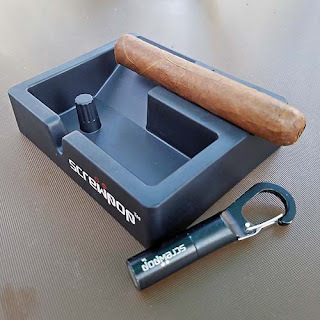 Right now I'm feeling pretty fortunate that after posting the press release, Screwpop® Tools asked me to review the newest addition to their line of cool, personal tools, the Screwpop® Ashtray. I've been using the ashtray for several days now, infact I'm using it right now as I type this review, and it works like a champ. Since the ashtray is geared for a single smoker, measuring just 1.25″ x 4” x 5″, it fits my needs most of the time and takes up far less table space than my other ashtrays. It's compact and light weight -- it's made from high grade melamine. The size and weight make ashtray easy to move around as I chase the shade on the deck all day long. Looking inside the ashtray you'll see it even has a nifty little ash knocker that I didn't think I would, but do find myself using all the time. At the end of the day a quick wash and dry will get the Screwpop® Ashtray looking like it's brand new again. 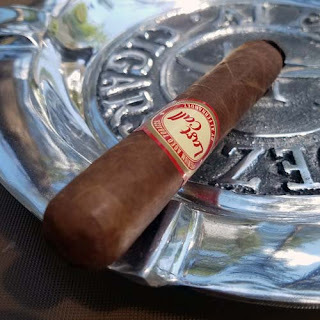 To sum things up, the Screwpop® Ashtray is my new favorite personal cigar ashtray. It's convenient to use, it's light weight and it just looks good sitting here on the table as I type. Plus, I tried it with everything from a Lancero to Gordo and it handle every size with ease. Well done Screwpop® Tools! Head over to screwpoptool.com and check it out and while you're there, check out the other great items they sell. As a side note the Screwpop® 2.0 cigar punch is included in the picture. I reviewed their punch almost two years ago and it's punched hundreds of cigars and even popped open a few beers. It still works as well today as it did right out of the box.